Why does Talking Mats work? Thanks to Fiona Kane from the Alzheimer’s Resource Centre in Clydebank for sharing this lovely story about a visit to a man who had had a stroke. He was able to explain his views and take part in self management without realising it! “Two of us visited a man who has aphasia. His wife is really struggling to communicate with him. She had been unable to attend the Talking Mats family training. I suggested the Talking Mats and they both agreed to try it out. I thought I would share it with you. When we arrived the man was snoozing in the chair. He was extremely apprehensive when we first introduced the Talking Mats. However he quickly became very animated and we were able to tune into what he was saying. A. asked him about gardening and he said he didn’t like gardening. He then invited us out to see his garden, was able to show us where he fell cutting a high hedge and indicated this was the reason why he had stopped working in the garden. He told us he didn’t like religion and this was because his Mum was so strict with religion when he was younger. He told us he really enjoyed photography and missed that. His wife is now going to buy a digital camera to help him continue with this. He also told us that he enjoys listening to the radio but not radio 4 as there is no music. His wife was absolutely amazed with the information her husband was able to communicate through the mats and he was able to express how much he enjoyed doing it. He was very animated and walked us out to the door. 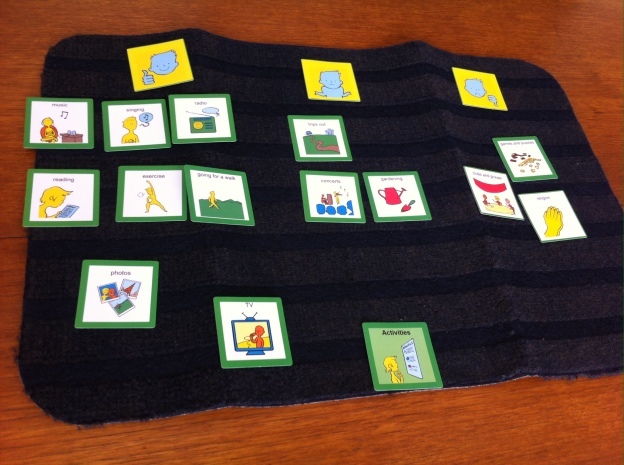 This entry was posted in Aphasia, Blog, Participation, Personalisation and tagged AAC, Participation, Personalisation, Talking Mats on September 26, 2014 by Guest Blogger. © Illustrative symbols are copyright of Adam Murphy 2013 and owned by Talking Mats Limited.